Reanne Evans from England successfully defended the World Ladies Snooker Championship. In the final she beat compatriot Katie Henrick 5-3 to earn £800. Evans recorded an 87 break in the final. This was the highest break of the tournament. It was the third world title in a row for Evans. In 2005 she defeated Lynette Horsburgh (Scotland) 6-1 and last year she beat Emma Bonney (England) 5-3. Eva Palmius beat Jenny Poulter 3-1 in the seniors final. There was no juniors event this year. Pam Woods and Chris Sharpe beat Joanne Davies and Tina Owen-Sevilton 3-1 in the ladies doubles. Joe Perry and Leah Willett beat Gary Wilson and Pam Wood 3-1 in the mixed doubles final. Chitra Majamairaj beat Emma Bonney 187-148 in the billiards final. 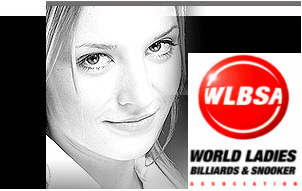 This championship is organized by the World Ladies Snooker & Billiards Association. It must not be confused with the IBSF World Championship. The tournament was played at the Cambridge Snooker Centre, England, 31st March to 5th April, 2007. If you were watching the snooker on the BBC yesterday you would have seen Reanne Evans in the BBC studio along side Steve Davis and John Parrott. Naturally she was there supporting her partner Mark Allen who was putting in a fantastic performance against the Dubliner Ken Doherty. Hazel Irvine (the BBC presenter) asked Reanne if she gave Mark any tips for playing at the Crucible (because she's already played there), Reanne said, "Yes, Pot balls!". Asked if they practiced together much, she said, "A fair bit, but Mark needs to practice against much tougher opposition". It was good to hear her thoughts.